The First Epistle of John in the New Testament is the fourth catholic or "general" epistles. Written in Ephesus about 90-110 AD, the epistle is traditionally attributed to the same author or authors who wrote the Gospel of John and the other two epistles of John. Not actually a letter, the epistle is a sermon written to counter heresies that Jesus did not come "in the flesh," but only as a spirit. It also defines how Christians are to discern true teachers: by their ethics, their proclamation of Jesus in the flesh, and by their love. 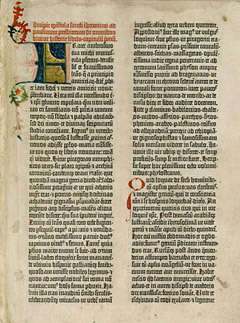 The epistle is traditionally held to have been written by John the Evangelist, and probably also at Ephesus, and when the writer was in advanced age. The Epistle's content, language and conceptual style is an indication that a common authorship existed between this letter, the two other letters attributed to the Apostle John, as well as the Gospel of John. Whether the author was the Apostle John himself, someone who wrote under his name and spoke "for him", or whether a body of authors contributed to the writing of all four Johannine texts is an open question. The author wrote the Epistle so that the joy of his audience would "be full" (1.4) and that they would "sin not" (2.1) and that "you who believe in the name of the Son of God... may know that you have eternal life." (5.13) It appears as though the author was concerned about heretical teachers that had been influencing churches under his care. Such teachers were considered Antichrists (2.18-19) who had once been church leaders but whose teaching became heterodox. It appears that these teachers taught that Jesus Christ was a Spirit being without a body (4.2), that his death on the cross was not as an atonement for sins (1.7) and that they were no longer able to sin (1.8-10). It appears that John might have also been rebuking a proto-Gnostic named Cerinthus, who also denied the humanity of Christ. The purpose of the author (1:1-4) is to declare the Word of Life to those to whom he writes, in order that they might be united in fellowship with the Father and his Son Jesus Christ. He shows that the means of union with God are, (1) on the part of Christ, his atoning work (1:7; 2:2; 3:5; 4:10, 14; 5:11, 12) and his advocacy (2:1); and (2), on the part of man, holiness (1:6), obedience (2:3), purity (3:3), faith (3:23; 4:3; 5:5), and love (2:7, 8; 3:14; 4:7; 5:1).